Precision Conversion at TTI | Tooling Technologies, Inc.
Engineering Mylars or original scribes up to 50″ width by any length. 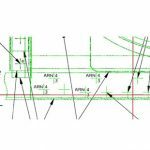 Tooling Technologies, Inc. provides the unique service of converting hand drawn engineering documents. This includes drawings, lofted Mylars, scribes and dimensioned engineering into digital data compatible with most CAD systems. 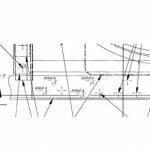 The originals are precision dimensionally-controlled drawings primarily used in the initial manufacturing of airframe detail parts. Typically the converted data is generated into a solid model and / or CNC cutter path data. TTI can convert documents up to 50 inches wide and any length. Tooling Technologies’ process is generating untold savings for aerospace manufacturers in the conversion of thousands of un-dimensioned Mylar layouts to CAD files. The traditional manual digitizing process takes approximately 100 hours per drawing and requires engineers trained in a high-end CAD system with a burden rate of about $125.00 per hour. TTI has developed our unique process, which has reduced digitizing time to 28 – 30 hours per drawing for an approximate cost of $1,500.00 – $2,000.00, a savings of $10,500.00. As Mylars age, over time, they will yellow, shrink and warp. To compound this problem, the distortion is typically not proportional, meaning that at one end of the drawing distortion may be minimal while at the other end it is much larger, based on the condition to which the drawing was stored and exposed. 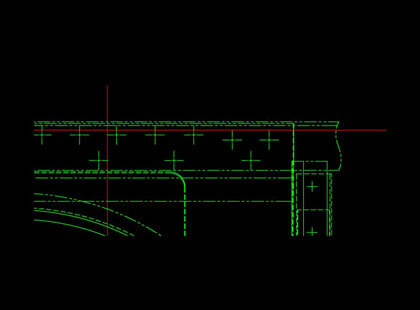 The advantages of converting Mylars to electronic CAD files are many. 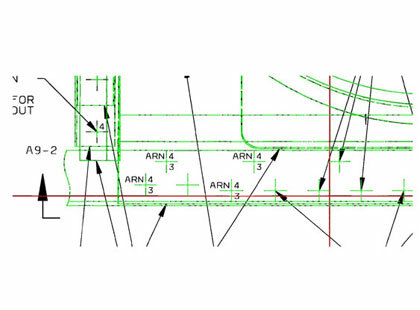 CAD files do not deteriorate over time, reduce the cost of engineering changes by eliminating the need to completely redraw the Mylar for any modifications, are easily duplicated and can be transferred long distances for the purpose of sharing work loads among other engineering groups, design review and providing detailed information to support personnel. CAD files also offer the ability to establish a database so they can be quickly retrieved. 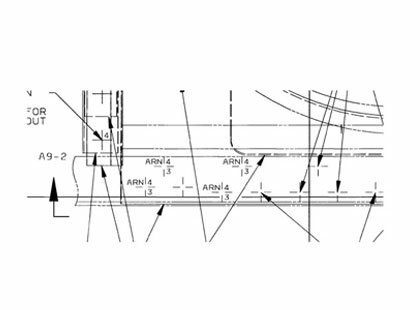 Most aircraft in operation today were created from manual layouts that need to be converted to CAD files in order to improve long-term logistical support. These drawings are un-dimensioned, contain complex geometrical entities, and are typically generated on a stable base Mylar. To maintain manufacturing integrity, the results of any such translation must be a precise representation of the original drawing. Tooling Technologies’ precision conversion method provides a cost effective method of converting source documents into electronic files with an extremely high level of accuracy. 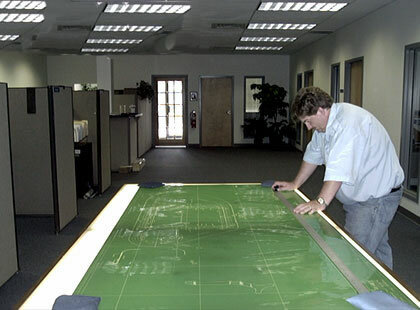 A trained technician performs a technical review of the supplied engineering Mylar. This review will identify up front any discrepancies in the provided original. This review confirms line width, clarity and dimensional stability of the Mylar original. Text quality and interpretation along with any visible imperfections are noted prior to scanning. A determination is made during the technical review as to whether or not the original must undergo a manual / pre-scan cleanup. This could include removing pencil marks, smudges, eraser debris, coffee stains or any other removable imperfections. Original Mylar drawings and Mylar output media are stored in a temperature / humidity controlled environment to inhibit expansion / contraction of the Mylars. Before scanning, Mylars are temperature controlled to assure grid lines or trammel points are exact dimensions when initially drawn. Following any physical cleanup of the original, the Mylar is scanned. An experienced operator then reviews the initial scanned image. If the initial scan is not up to the quality standard required for final editing, the original will be re-scanned after the scan features have been adjusted to compensate for any variables in the original Mylar. The technical aspect of the edit process is to recreate any and all features depicted on the Mylar and to insure that the electronic digital data exactly matches the supplied original. Upon receipt of the successfully scanned image, the editor will electronically clean up the image. Image enhancement will electronically clean up soiled, faded, deteriorated, and inferior quality images. The image enhancement process will reduce background noise and improve uneven line widths, dull edges, faded areas, and uneven illumination. If required on the order, special image enhancement (e.g., removal of date stamps and other markings, realignment of images to within 5 degrees or less of skew, cropping, rotation) will be accomplished during the editing process. Additionally, we use a process known as “rubber sheeting” to make electronic adjustments to compensate for distortion and dimensional run out. This process insures dimensional stability when comparing the original to the digital reproduction. 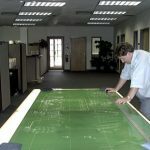 The final step in providing a digital reproduction of an engineering Mylar is to certify that the electronic data matches the supplied original. An experienced CAD technician with extensive aerospace background will conduct a 100% quality review of a verification plot generated by a calibrated digital plotter. This verification will evaluate all features to insure and certify that all critical features are held within the tolerance as indicated on the order. Our quality process is in accordance with ISO standards. TTI’s flagship service is reverse engineering of engineering Mylars and production parts as well as complex form dies and sophisticated tooling. The advancements in software technology and the aggressive nature of TTI’s research and development have led to the success of the precision document conversion service division. Our converted data is compatible with Unigraphics, Pro/Engineer, Step and a variety of other Hi-End CAD and CADCAM design stations as well as low end desk top CAD systems. 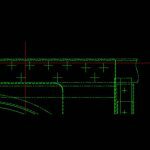 IGES, DWG, DXF, TIF, BMP, ASCII and TEXT (other formats available). TTI provides electronic data in a variety of formats; Thumb Drive, CDDVD, 3.5 inch and AIT-1 or AIT-2 8mm tapes. Additionally, the data can be delivered electronically via E-mail or FTP over the Internet. TTI will provide an index for all converted data. At a minimum, the index will consist of the document number, document title, page number, revision level, date and purchase order and TTI job number reference. TTI will maintain a backup copy of all data generated. The backup copy will be maintained for a period of 12 months after project completion, unless otherwise specified for a different period by the order. Tooling Technologies incorporates the use of the cutting edge technology in equipment and software as related to precision document scanning. TTI has multiple CAD stations, precision scanners and plotters to service all your conversion needs.